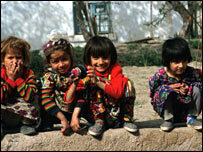 Tajikistan is in the grip of emergency food shortages, the UN's World Food Programme is warning. The deteriorating food situation is part of the energy crisis which hit the mountainous nation in the middle of its coldest winter for five decades. The cost of food has tripled in recent months, partially because of rising world prices. Some humanitarian agencies claim Central Asia's poorest nation is heading towards catastrophe. It's well below zero in Tajikistan, but most people have no electricity, no heating and now, increasingly, many don't have enough food either. One family in the village of Sagdyan, outside the capital Dushanbe, said their four children were surviving on milk and rice. Their next door neighbours could not afford even that.